As San Luis Obispo grows and changes, itâ€™s important to remember that while things arenâ€™t what they used to be, theyâ€™ve never been better. To capture the spirit of business in SLO, past, present and future, New Times tracked down the hardworking owners of five of the cityâ€™s oldest and most well-established independent businesses, and we listened to them reminisce about the past and contemplate the future, for their stores and for the community at large. ALL IN THE FAMILY : Tom Belloâ€™s parents planted the seed for Belloâ€™s Sporting Goods in 1945 by opening a B. F. Goodrich franchise. Gradually, they expanded into toys and other products. Tom Bello is the child in this photo. #While developers and residents fume over projects and proposals, the profits to be made or the civic charm to be lost, longtime business owners offer a calming voice of reason amid some storms of controversy. In their 20 to 50 years in business, the most important lesson theyâ€™ve learned is to change with the times. â€œYou always have to change, or you just get left behind the times,â€? said Tom Bello. Belloâ€™s parents planted the seed for Belloâ€™s Sporting Goods in 1945 by opening a B. F. Goodrich franchise. Gradually, they expanded into toys and other products. Within a few years, they dropped the franchise completely and evolved into an independent retail store, specializing in athletic uniforms and sporting goods. Tom Bello has worked there full-time since 1959, long enough to see the town change considerably. 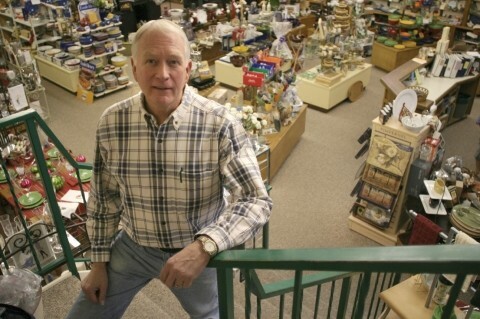 Bob Douglass, owner of San Luis Luggage, purchased a Rascoâ€™s Five and Dime store in 1971. It operated as a franchise until 1981, when Rascoâ€™s went bankrupt as a franchise company. At that point Douglass changed his shop into a variety store, ordering primarily through True Value. In 1984 he added bags and luggage, and by about 1991, he stopped buying variety altogether to deal exclusively in luggage. â€œWeâ€™ve all evolved into something else,â€? said Douglass, â€œand weâ€™ve adapted with the times.â€? 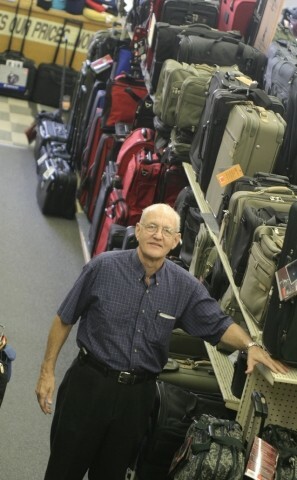 CARRYOVER BUSINESS : Bob Douglass, owner of San Luis Luggage, purchased a Rascoâ€™s Five and Dime store in 1971, which has since evolved into a specialty luggage store. #Dean Moore recalls the long legacy of his Monterey Street business, Fordenâ€™s. Stan Forden opened the shop as a true hardware store in 1939. Over the years, Forden added other products like kitchen appliances. He retired and sold the shop to Mr. Vasquez, who retired and sold the business to Moore and his partner in 1989. Fordenâ€™s eventually grew from a hardware store into a kitchen gourmet and fireplace shop, and, in order to stay competitive, Moore has added more services, including fireplace delivery and installation. â€œYou just evolve as you go along and find a new niche to be in,â€? Moore said, â€œbecause hardware stores were becoming a thing of the past, and now theyâ€™re big chains.â€? Beth Law has made a few changes with her hobby shop over the past 40 years, too. 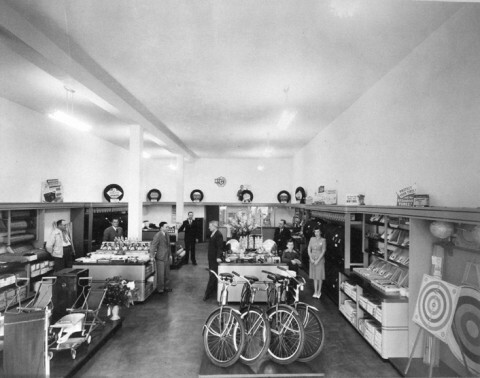 In 1960, Law and her late husband purchased Adamâ€™s, a model shop located in todayâ€™s Longs Drugs building on Marsh. Twelve years later Lawâ€™s Hobby moved several blocks down the street, adding more and more arts and crafts products all along. As a female business owner in a predominantly male profession, Law remembers encountering a fair amount of resistance early on. But in time, her inventory expanded from $10,000 to about $500,000, and that kind of success speaks for itself. Sheâ€™s seen some decline in business this year, which she attributes to increasing competition from online specialty shops, but otherwise Law is still sanguine about doing business downtown. â€œI donâ€™t think downtown will get damaged,â€? Law said, â€œas long as they donâ€™t build that Marketplace.â€? 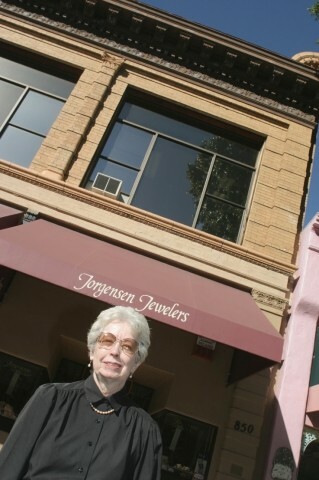 Jorgensen Jewelers opened in San Luis Obispo in 1959, and current owner Nina Chapman acquired the business from her sister and brother-in-law in 1970. The store has relocated once, but unlike her peers, Chapman has made very few changes to her inventory line. â€œThe product we carry has changed some,â€? Chapman said, â€œbut jewelry is jewelry.â€? CHANGING WITH THE TIMES : Fordenâ€™s opened in 1939 as a hardware store, which Dean Moore purchased in 1989 and grew into a kitchen gourmet and fireplace shop. #Having passed the test of time with flying colors, all of these owners show confidence in the current course of their businesses. â€œWeâ€™re smokinâ€™,â€? Moore said of his longstanding fireplace business. â€œBusiness is strong.â€? Unlike most businesses, Fordenâ€™s actually prospered in the post-9/11 recession. With the decline in travel, people spent more time at home and more money on home products like kitchenware and fireplaces. â€œPeople stayed home, fixed up their houses, and entertained guests.â€? Moore said. Businesses like San Luis Luggage, which focuses on travel products, were hit hard by the events of 2001, but with tourism on the rebound, Douglass is looking forward to a strong holiday season. By sending catalogs to 12,000 homes, San Luis Luggage also aims to fill the gift gap left behind by Marianneâ€™s Hallmark. This large vacancy next door has reduced foot traffic on that end of Chorro Street, and Douglass hopes to see it filled soon. But in the meantime, heâ€™s seizing the opportunity to offer more gifty items for Christmas. Bello anticipates a better holiday season for his sporting goods store, mainly because the construction that disrupted that end of Monterey Street has finally cleared up. Downtownâ€™s main arteries â€” Monterey and Higuera â€” need to be kept open, he said, or people just go elsewhere. He also hopes that this December doesnâ€™t bring any major disruptions, as did the San Simeon quake during the busiest shopping week last year. One of the greatest concerns for independent business owners and nostalgic SLO residents is the encroachment of national chain stores over local mom-and-pop shops. But most of these business owners are surprisingly agreeable to the addition of national chains downtown. â€œIf you donâ€™t have those chain stores, they just go elsewhere,â€? said Bello, and the downtown will dry up. The consensus is that anything downtown, local or national, will draw more people downtown, and that these chain stores are not compromising the townâ€™s character. A lot of people worry that SLO is turning into â€œAnytown, U.S.A.,â€? but Bello disagrees. â€œI donâ€™t think itâ€™s happening in San Luis, just look around at all the local stores,â€? he said. â€œI think it only helps. It will always be a mix of locals and nationals â€¦ as it always has been.â€? 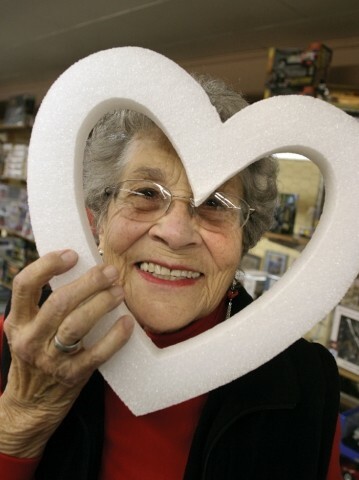 KEEPING CRAFTY: Beth Law and her late husband purchased Adamâ€™s model shop in 1960, which later became the Marsh Street arts and crafts store Lawâ€™s Hobby. Law is optimistic about the future of downtown â€œas long as they donâ€™t build that Marketplace. #Chapman understands many peopleâ€™s resistance to change, but doesnâ€™t see the need for it. She certainly doesnâ€™t attribute SLOâ€™s change of character to a change in the roster of downtown businesses. If anything, the change in stores only reflects the cityâ€™s changing population. â€œThe stores donâ€™t change the town as much as the people themselves,â€? she said. The Copelandâ€™s project, which should be open in time for Christmas 2005, will add a number of chain stores, including Crate & Barrel, to the downtown landscape. 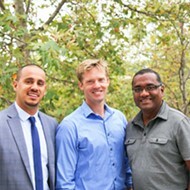 But these owners all agree that the new development will only help by bringing more foot traffic downtown. They unanimously welcome the project as an enhancement to the downtown. â€œWe donâ€™t see Crate & Barrel as our competition, â€œ Moore said. â€œItâ€™s all spendable dollars, but the key is traffic.â€? The foot traffic is welcome, but with increased density, street traffic continues to be a legitimate concern. The Copelandâ€™s project will only succeed in drawing additional shoppers, if those shoppers have a place to park. 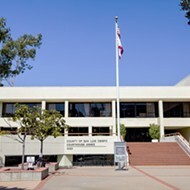 Completion of a new parking structure, adjacent to the library, is slated to coincide with the opening of the multilevel shopping center. The participants in this forum also expressed their gratitude to Copelandâ€™s for rescuing the Downtown Center development, which now houses Barnes & Noble, the Gap, and a string of other corporate chains. The original developers ran out of steam, and for over a year, the heart of downtown was scarred by a giant hole. Finally, Copelandâ€™s stepped in and saved the day. â€œThe town was blessed that Copelandâ€™s came along and built whatâ€™s there,â€? Moore said. â€œThe main problem with chain stores and corporate stores is that they donâ€™t invest the same way in the community. Local businesses keep their profits in the community, but that doesnâ€™t mean we donâ€™t need [the corporate chains],â€? said Moore. Moore and his colleagues also agree that downtown could use an anchor store at one end or the other. Itâ€™s nothing new; in fact, Ross used to be a JC Pennyâ€™s, and Sears was once downtown as well. Rileyâ€™s, formerly in the Copelandâ€™s Sporting Goods location, was another major downtown draw. Over the past couple of decades, those department stores all moved out of downtown or out of SLO entirely. â€œIt was a big loss to downtown,â€? Law remembers. â€œThey drew people.â€? There has been mention of a major department store in the vicinity of Bank of America on the other side of Santa Rosa, but as of now, those are only rumors. 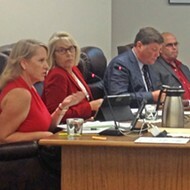 â€œWe need something to bring people downtown,â€? Chapman said. â€œOne or two little shops canâ€™t do it alone.â€? LIKE A ROCK : Jorgensen Jewelers opened in San Luis Obispo in 1959, and current owner Nina Chapman acquired the business from her sister and brother-in-law in 1970. â€œThe product we carry has changed some,â€? Chapman said, â€œbut jewelry is jewelry." #For the most part, no one seems particularly concerned with increased competition downtown; they all see it as an improvement. Simply put, more stores means more shoppers. 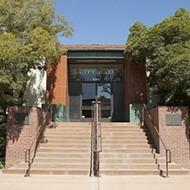 Douglass described how there were once five shoe stores next to each other on Higuera Street, and they all did very well. The competition actually created more business â€” people knew where to shop for shoes. Eventually some of them started moving, and then business dropped for all of them. Competition downtown is one thing, but shopping centers on the other side of town are whole different ball of wax. The Marketplace project is still considered something of a â€œpolitical hot potato,â€? but itâ€™s hard to find anyone downtown who will sing its praises. â€œItâ€™s just an awful lot of retail square footage for the population,â€? said Bello. And as for the Marigold and Madonna shopping centers, â€œThey donâ€™t help, unless you have the population growing rapidly, which we donâ€™t.â€? â€œThereâ€™s only so many pieces of the pie,â€? said Chapman. â€œI donâ€™t know that thereâ€™s anything people can do to stop it. Itâ€™s the way of the world; itâ€™s the way people want it.â€? Douglass doesnâ€™t see Costco or the Marketplace as a serious threat to his luggage business. â€œWeâ€™ve grown tremendously in categories. We specialize in travel accessories,â€? said Douglass, and thatâ€™s how heâ€™s survived, with a selection of bags that department and discount stores canâ€™t match. â€œThere are very few items that Costco has that I even carry.â€? They concentrate on low-end, bare bones, he contends. Moore, too, emphasizes the differences that distinguish his business from the discount box stores. â€œCustomers that come in [to Fordenâ€™s] want the unique experience and the service. They come in day after day and they appreciate us, and we understand that. But weâ€™re never going to sell it as cheap as Costco. You can go to Costco and buy a Henckel knife,â€? Moore added, â€œbut itâ€™s not the same Henckel knife youâ€™ll find at Fordenâ€™s. You have to be a wise shopper. â€œThe real issues are spendable dollars, and thatâ€™s what most people look at,â€? Moore explained. â€œIf you divide the spendable dollars by the kind of square footage were looking at, its going to hurt,â€? but no one knows how itâ€™s going to go. â€œThereâ€™s not a lot there that competes with downtown, but whenever you divide the shopping experience, itâ€™s going to hurt.â€? Chapman is far more concerned about the impact of a seismic retrofit. Thereâ€™s a high likelihood that the downtown jeweler would have to relocate for at least six months â€” an impossible feat considering the cost of installing a vault and the security features necessary for her type of business. â€œThe relocation may put me out of business entirely,â€? Chapman said. She also has five employees depending on her: â€œNone of them can go six months without their salary. Neither can I. Nor do I want to. I love being downtown.â€? Law has less to worry about with the retrofitting. The building she rents is not among the 77 downtown mandated for seismic repairs. It was built by her upstairs neighbors, the Free Masons. 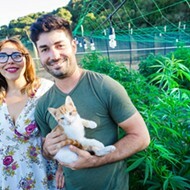 She may not understand or agree with everything the secret society stands for, but sheâ€™s happy to report that â€œthe building is engineered the way it should be.â€? Law may not be shaken up about seismic mandates, but she is concerned about keeping people interested in downtown. She believes the city and the Downtown Association should assume a more proactive role in preserving the town, rather than simply entrusting matters to the invisible hand of the free market. â€œSan Luis is worth fighting for,â€? Law said. â€œ[The Marketplace] would be an absolute devastation to the city.â€? Law would also like to see the city promoting more events and activities. Though she acknowledges the problems created by Mardi Gras, she believes these kinds of parades, like the springtime Fiesta of the old days, are vital to the downtownâ€™s livelihood. Whatâ€™s needed, according to Moore, is good information that will help people understand the issues. No one sees the whole picture â€” the cost and the impact.